I have seen many users frustrated with Windows defender and they want to get rid of it; Windows Defender automatically gets disable when you install another antivirus program but in many cases, like if you don't want to install another program or want to disable or turn off Windows defender for a while this article is helpful. Since Windows has adapted freestyle notification area and Windows setting interface, it gets lot easier to manage everything with one setting menu and faster Windows search. Open "Settings" Window (Press Win + I). Click on Windows Defender settings. Turn off real-time protection from right column. 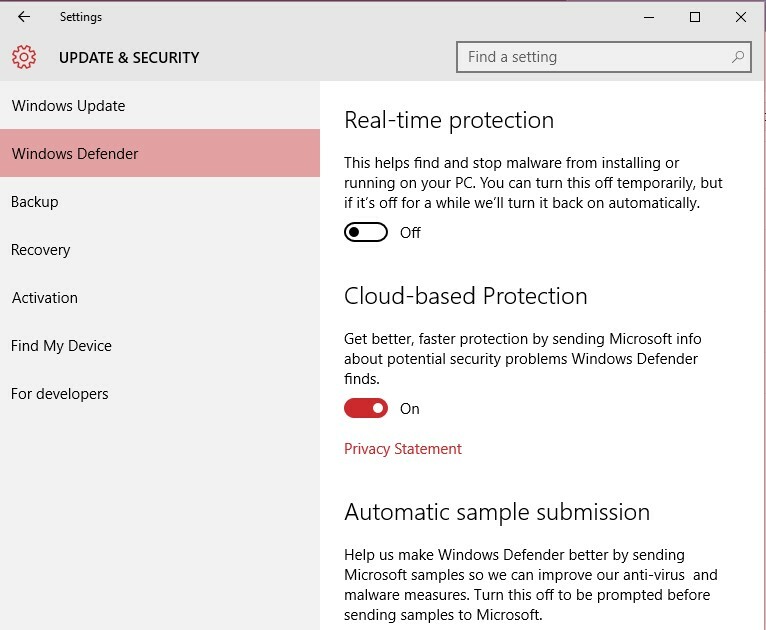 As you can see in above screenshot, Windows defender's setting are under Update and Security. You can use start menu's search box as well. You can adjust online sample submission settings and if you are facing issue regarding Windows defender's high usage issue read this post on msmpeng.exe.